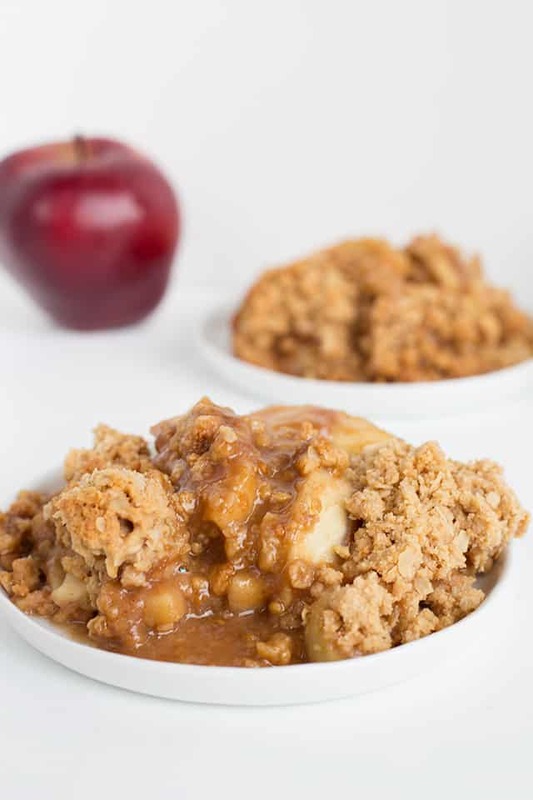 This peanut butter apple crumble is a fun, unique fall dessert! The tart granny smith apples are smothered in brown sugar and peanut butter. They’re topped with a peanut butter crumble and baked until bubbly. The apples come out tender and are soaking in an apple infused peanut butter sauce. 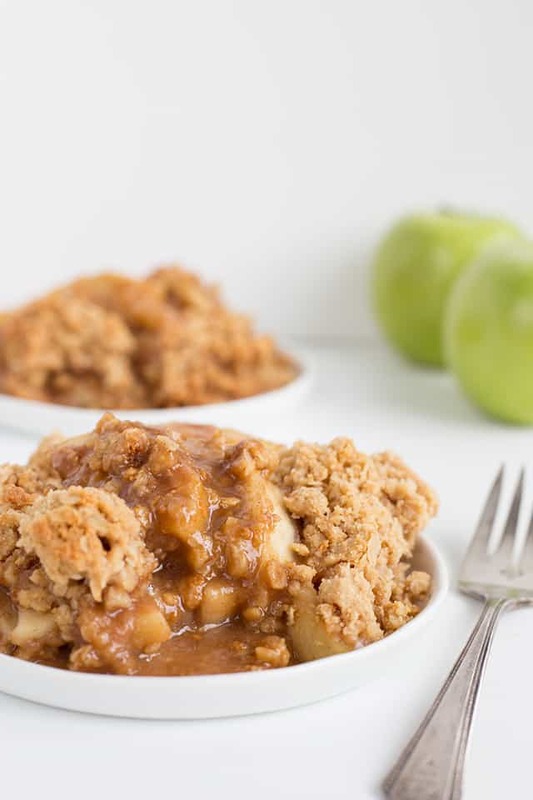 I also have Slow Cooker Apple Peanut Butter Crisp version. Guys, I can eat peanut butter pretty much on anything. My brother hooked me up with apples and peanut butter when we were little. He actually introduced me to the combination and it’s been a go-to snack for me since. I now fix my little one apples with peanut butter. Well, more accurately, I fix him apples and Reese’s spread. So what’s better than to load a heap of peanut butter and apples into a crumble? Yeah, nothing. This peanut butter apple crumble is the best. The peanut butter adds a creaminess to the crumble. I could eat this peanut butter crumble topping all on its own. Forget the apples! Totally joking, it probably wouldn’t be nearly as good if there wasn’t that apple crumble filling underneath it. 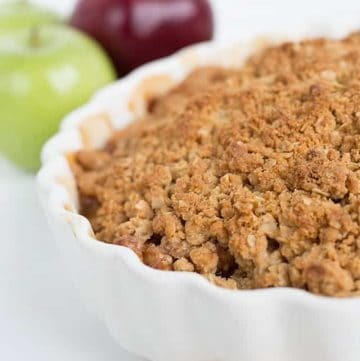 The peanut butter apple crumble topping is like a crunchy peanut butter oatmeal cookie and I LOVE it. I’m the type of person that will eat the crumble/crisp/streusel topping from a dessert even after I’m full because it hurts me to see such a delicious thing go to waste. PLEASE tell me you’re like that too. It’s really simple. Add the flour, oats, and sugar into a bowl. Stir until it’s all blended together and begin working in the butter and peanut butter. In most cases, you won’t be adding peanut butter. Since I love peanut butter and apple together, we’re going for it. Using a pastry cutter, two forks, or your hands, break the butter up and work in the peanut butter in. The crumble will be pretty dry and.. you guessed it, crumbly after everything is incorporated. 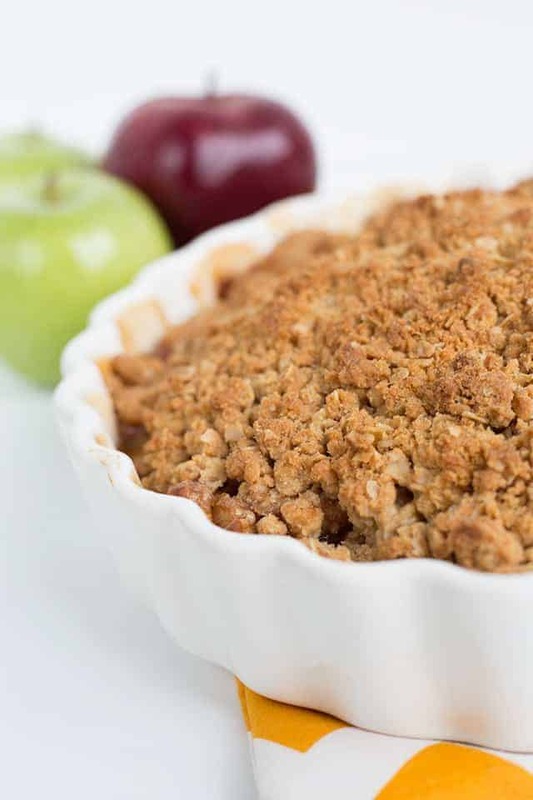 I use my hands and make small clumps of the crumble and add it to the top of the peanut butter apple crumble. If the clumps are too big, I break them apart into smaller pieces. I normally freeze my streusel to help keep its shape and I originally had it in this recipe but I found that it wasn’t necessary. I prefer granny smith apples for anything I bake. Confession time, I don’t always use them though. I will use other apples if that’s all I have on hand but the apples can easily become mushy and often are sweeter than the granny smith apples that are recommended. We’re looking for an apple that’s still slightly firm and can hold its shape after it’s baked. You’ll also want an apple that’s tart so it can cut through some of the sweetness. 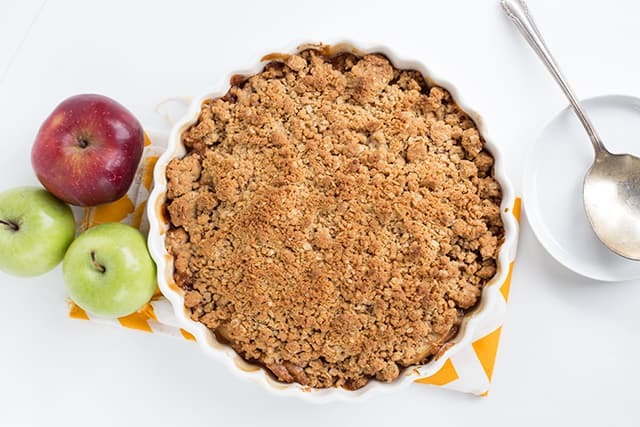 Do you cook apples before making apple crumble? No, at least not in this recipe. How long does peanut butter apple crumble last? Two days covered at room temperature or refrigerated up to 4 to 5 days. 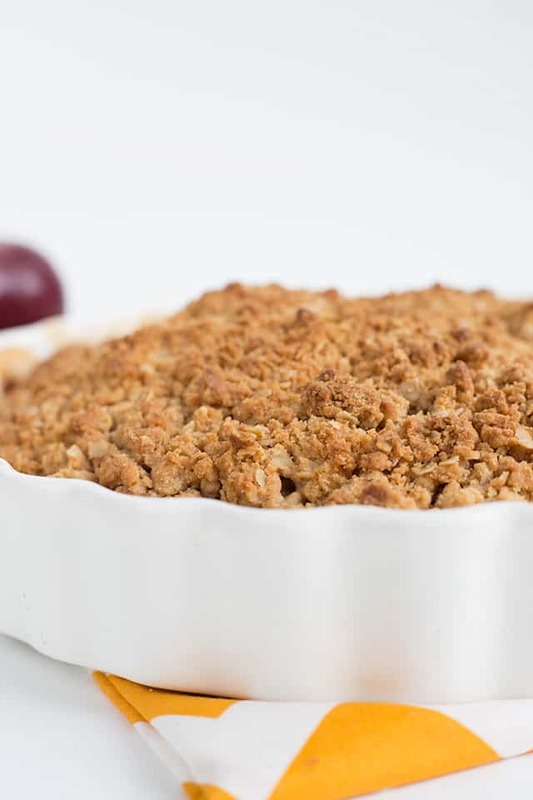 How to store apple crumble? Loosely cover it with plastic wrap either at room temperature or in the refrigerator. 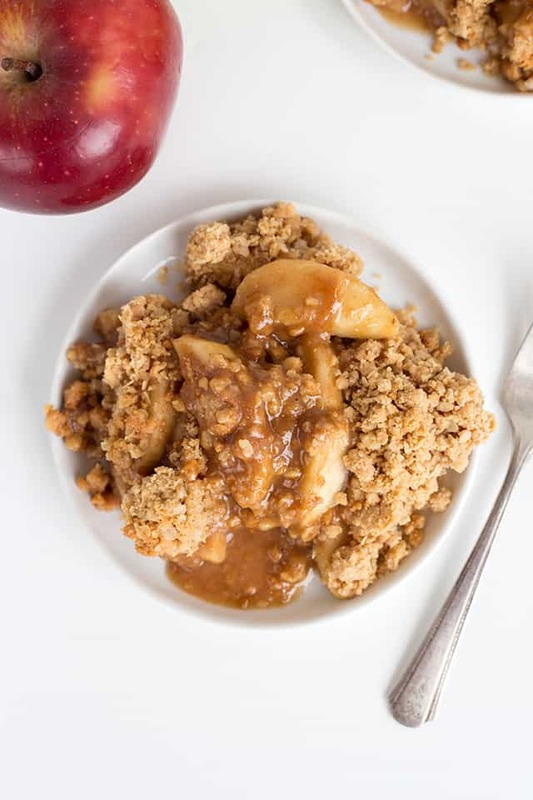 For this peanut butter apple crumble, tart granny smith apples are smothered in brown sugar and peanut butter. They're topped with a peanut butter crumble and baked until bubbly. The apples come out tender and are soaking in an apple infused peanut butter sauce. In a large bowl, add flour, oats, and sugar. Whisk together until incorporated and there are no lumps. Add in the butter and peanut butter. Using a fork, cut in the butter/peanut butter until it resembles small pebbles. Set aside. In a large bowl, add in brown sugar, flour, and cinnamon. Whisk together until combined and no lumps are left. Add in the peanut butter and stir with spatula until it's incorporated into the dry mixture. Add in the apples and stir until the apples are completely coated. Pour the apples into a 10-inch pie plate. Pile the crumble topping on top of the filling. Place into a 350 degree oven for 40 - 45 minutes or until golden brown and bubbly. Mine took 45 minutes. Place tin foil underneath dish just in case any filling bubbles over. Oooh, I’ve never seen an apple crumble with peanut butter! I need this in my life! Me either! I can’t believe I didn’t think of it sooner. I’m a apple and peanut butter fanatic! That’s an awesome idea. I *just* made an apple crumble that I thought was the best thing ever…. but now I am just disappointed that I didn’t see this recipe prior to making it! Thanks for ruining my boring peanut-butter-less apple crumble. haha just kidding. Next time, there will be peanut butter! is the nutrition info for the whole pie?